The Tour includes: Airport Transfers, Accommodation, Coach Transport, 2 Dinners, City Highlights Tours in Christchurch, Wellington and Auckland, Scottish Haggis Ceremony, Entry to Olveston House, Milford Sound Cruise, Visit to Greenstone (Jade) Factory, TranzAlpine Train Journey, Tranz Coastal Train Journey, Montana Winery Tasting & Afternoon Tea, Interislander Ferry Crossing, Visit to Te Papa Museum, Visit to Huka Falls, Entry to Agrodome, Entry to Rainbow Springs Park, Entry to Te Puia Thermal Reserve, Entry to Skyline Skyrides and Luge Ride, Entry to Glowworm Grotto, Entry to Skytower. Pass picturesque Lake Hayes on to an area steeped in fascinating history relating to early settlement and the goldmining era, to Lake Wanaka, a picture postcard resort on the lakes edge with a spectacular mountain backdrop. Pass Lake Hawea and the upper reaches of Lake Wanaka to Makarora, cross the Haast Pass into the Mt Aspiring and Westland National Parks. Drive north along the coast to the magnificent glacier region and visit the National Park Headquarters or take the optional guided walk to the glacier’s terminal face. Time for an optional helicopter flight over the glacier then on to Franz Josef. Snowcapped Southern Alps dominate the skyline as you pass dense bush, tiny landlocked lakes and small pockets of farmland. Visit a Greenstone (Jade) factory where craftsmen cut and polish giant boulders to create fine jewellery. Now join the Tranz Alpine train for one of the most spectacular rail journeys in the world. 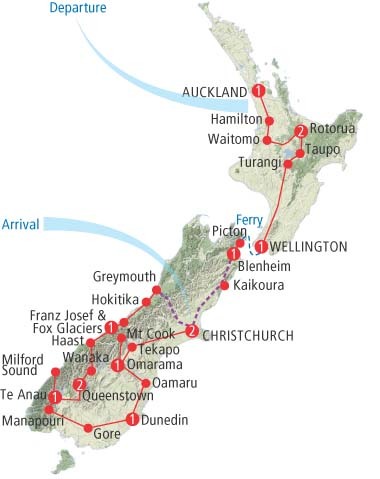 Through rainforests to Otira, snowcapped peaks of the Southern Alps, the rugged Gorges of the Waimakariri river and across the Canterbury Plains to Christchurch. Join the Tranz Coastal train for a kaleidoscope of scenery across fertile Canterbury farmland through the Hundalee Ranges. Follow the Pacific coastline, with the Kaikoura mountains forming a rugged backdrop to the west, passing tiny holiday settlements and Kaikoura, famous for whale-watching. Arrive in Blenheim early afternoon. A short tour of the area includes a visit to Montana Winery. Enjoy a hosted tour of the winery, learn about and taste a range of the famous local wines (purchase if you wish) followed by afternoon tea. A sightseeing tour visits the Agrodome for a display featuring New Zealand’s various sheep breeds with a shearing demonstration. See pools of brown and rainbow trout at Rainbow Springs Park and native birds including the Kiwi. Visit Te Puia, the Maori Arts and Crafts Centre and Thermal Reserve, with boiling mud, silica terraces and Pohutu Geyser. The spectacular Skyline Gondola offers superb views over city, lake and mountains and for a little excitement, try a Luge ride with compliments. Time for optional activities this afternoon before a Maori hangi (meal) with a selection of traditionally prepared meats and vegetables plus conventional dishes, followed by a concert featuring Maori songs, chants and the stirring haka (entire group). It is farewell to your travelling companions. You will be transferred to to Auckland International Airport to join your flight home.